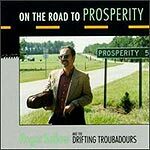 CD review: "On the Road to Prosperity"
This review first appeared in the June 12, 1992 issue of the North County Blade-Citizen (now North County Times). If you miss the grand days of Rose Maddox and the Carter Family, then Roger Bellow is likely to grab your attention. This is the real stuff here, old time country, played with talent and respect. While Bellow doesn't have the world's greatest voice, he has an excellent ear for finding old gems. Traditional favorites such as "Did the Man in the Moon Come From Texas," "Kentucky Means Paradise" and Don Reno's "I'm the Talk of the Town" are all found here, among others of similar quality. And Bellow surrounds himself with musicians as good as the songs; people such as vocalist Melba Montgomery, pedal steel guitarist Don Helms, and Gordon Terry on fiddle. The arrangements are simple, the musicianship stellar (Bellow plays a mean fiddle in addition to singing); it'd be hard to go wrong with this one.